Celebrating a century since opening the Nozawa Onsen Ski Resort, the Nozawa Onsen Ski School proudly continues to spread the joy of skiing and snowboarding to those new to the sport, as well as helping old hands develop their techniques. For international guests we have a team of professional international instructors from around the world. No matter how young or old, new or experienced, we offer a variety of packages to suit your needs. Contact the Nozawa Onsen Ski School to see what we can offer you! Our group ski and snowboard lessons will help you to learn to ski/snowboard or to fine tune your techniques with other guests of similar ability. 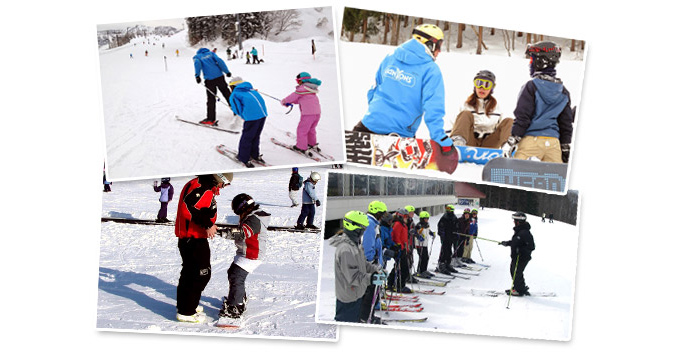 Group lessons for very first timers are run daily for infants, children and adults for both ski and snowboard. Group lessons for other ability levels may be available depending on instructor availability. For more information, please come to the front desk at the Hikage Ski Center during reception hours. > 3 yr olds can participate in private lessons. > Age groups may be mixed with smaller numbers of participants or with similar ability levels. Make the most of your time on the slopes with a private lesson. You pay per instructor so you can decide how many people you would like in your group (up to 8 people) and customize the level to your participants. This is the BEST way to improve fast with more time working on your skills. Whether you are a first timer or an experienced skier looking to improve on technique or get rid of bad habits we have an instructor that will suit your needs. Instructors are limited so it is recommended to make a booking well in advance. > Please see ability levels before you make booking. The school is open for enrolments from 8:30 am until 5 pm daily. We strongly advise booking in advance in peak seasons (Dec - Feb) The desk can become very busy for morning sign ups, so we recommend coming in early.. The following ability levels show what skills you will be working on at each level. If you can already perform the skills at a level proficiently please proceed to the next level. Please note that these lessons may be full depending on the number of instructors available and the number of pupils enrolled on that day. Nozawa's only English backcountry guide service! Make the most of your powder time at Nozawa by hiring a professional mountain guide to safely guide you around Nozawa's backcountry. BC tours are the best way to learn about Nozawa and surrounding area stashes and our crew of highly experienced international guides will ensure you have an amazing day! We keep the group sizes small to maximize the riding time and freshies! It is best if you have a group with ability levels that are relatively close so we can customize the terrain for you.